What do I need to pack in my birth bag? Are you the type of mom to come rolling into the hospital with two suitcases and an overnight bag that have been packed and sitting by your front door since your 20 week ultrasound? Or, now that those first contractions have started, are you quickly googling 'What to pack for my hospital birth bag' and running around the house gathering up random objects and sticking them in a plastic grocery bag? Either way, it's OK. You can relax because regardless of what you do or do not bring, you are still going to have your baby. Ultimately, you don't need to bring a darn thing to the hospital except a laboring mom! I'm going to give you two lists- one for the things I carry with me and another for the things my clients bring and most often use. 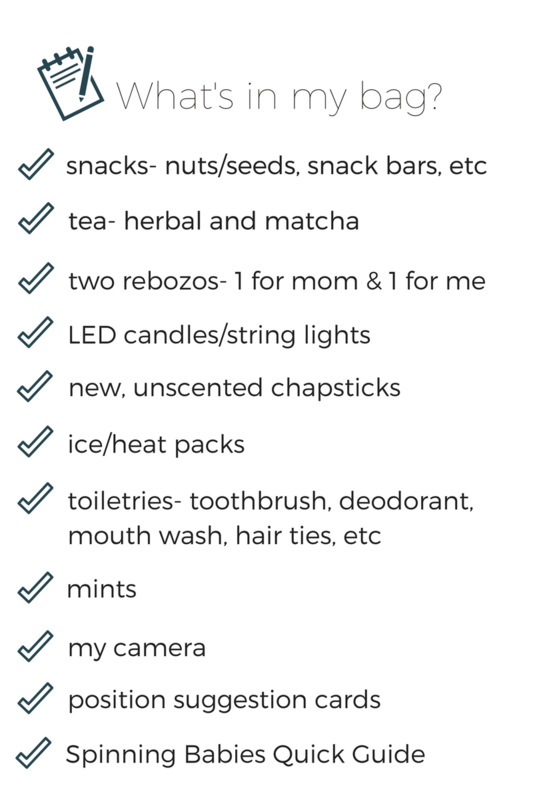 Almost every birthing mom says she doesn't know why she packs half the stuff she does and I can tell you that I don't use even a fourth of all that I bring at every birth but... it's so nice to know that if I need it, I have it. So, go ahead and show up at the hospital with nothing or bring a caravan of people who carry in your many bags (I picture this like in Aladdin when he parades through town...). It really doesn't matter in the big picture. You're going to come home with a baby either way! Charging cords, USB speaker, change of clothes, wash clothes, hair ties, combs, massage tools, oils, honey sticks, coconut water, straws and my iPad. A going home outfit for mom and baby- make sure mom's fit at about 6 months pregnant because you won't be back into your pre-pregnancy clothes yet! The hospital will have diapers, soaps and lotions for baby but if you prefer certain brands be sure to bring your own. Just relax... Yeah, that's a whole lot easier said than done! Contractions generally have a rhythm and predictability about them. They begin gradually, build in intensity, last for a predictable amount of time, come back down and then are done. You can follow them with your mind. Well, in short, yes... or maybe it's no... Was that not a helpful answer? You hear both extremes from "It's the worst pain I've ever experienced in my entire life" to "It was exhilarating" and even "orgasmic". So who's right and what should you expect? If you did it you probably laughed a little at the silliness of it... Or at least cracked a smile I hope! Even though this post has nothing to do with labor tips, I'll throw one in for free. Ok, now for what I really wanted to tell you! Not only am I now officially done with my training, because of choosing to affiliate with DONA International, I am committed to continuing my education as a birth worker and excited to uphold DONA's vision of a doula for every woman who wants one. And on top of all that I get to use some really cool initials behind my name! CD(DONA)!